Is Direct Mail for Real Estate Investors Worth It? 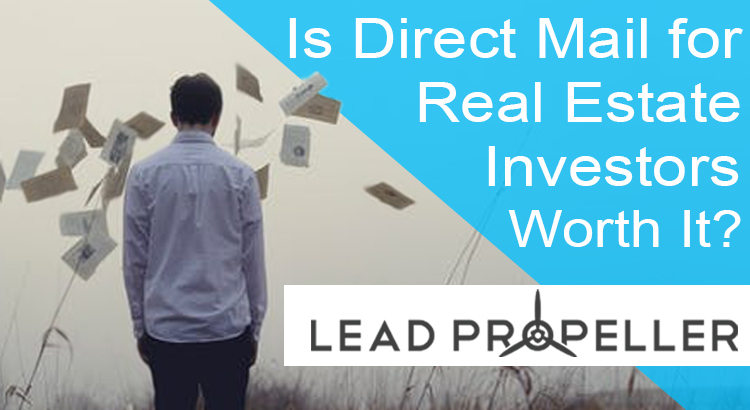 Is Direct Mail for Real Estate Investors Working? As an active investor, you’re already doing lots of different types of marketing. Since you’re marketing off and online, you’re bound to notice that some marketing strategies are working better than others. So the question needs to be asked: Is direct mail for real estate investors worth it? “Yes!” You might be thinking to yourself, “I got a conversion from direct mail just last month.” That’s great! How many post cards did you send out before you got that one conversion? 100? 500? 2000? That’s where the problem is. Yes, direct mail will still probably get you some conversions. And, yes, direct mail might even get you a decent response rate, but what direct mail isn’t doing is staying cost effective. What do I mean by that? Let’s find out! According to SourceLink, doing direct mail for real estate investors means that “lists can cost anywhere from $0.03 – $0.05 all the way up to $1.00/name“. Which might not sound so bad, until you look at how many direct mail postcards you should be sending out to reach your target audience. Depending on your market size, you need to be sending out mailings of roughly 500 – 2,000 pieces of mail. Again, depending on your market, you’ll need to be sending those mailings out 1 to 2 times a month. So, let’s put that together to see just how much direct mailing will cost for one year of marketing. At $1.00 a name for, let’s say, 1,500 mailings two times a month, you’ll be spending $36,000 a year on direct mail! That’s almost someone’s starting salary! Take a look at that return. Just looking at the numbers, if the return is smaller than the cost, then it wasn’t worth it. That’s just simple math. Now, we were working with a hypothetical situation. But direct mail for real estate investors often looks just like that. What we were just looking at was only focusing on the money. The truth behind direct mail is that you’re sending out lots of postcards a month, that adds up to cost lots of money a month, to people who aren’t motivated sellers. Essentially, what direct mail is doing is casting a giant net, right? Except, you don’t even know how many fish are in the lake your casting to. That’s the real problem with direct mail: the majority of the people reading your postcards aren’t motivated to sell their house, let alone to a real estate investor. Marketing Charts, an marketing statistics online database, found that “postcards have a 2.47% response rate” and that “letter-sized mail has a 1.28% response rate” for businesses. Which would mean that out of the 3,000 people a month that got your postcards, only 74 responded. For real estate investors, however, a response isn’t a lead. How many times have you gotten a phone call from an angry person because you sent them a postcard. I’d be willing to bet it happens a lot. In fact, our in-house investors here have gotten death threats from someone who received a postcard from them! How ridiculous is that, just for a piece of paper in the mail? Not all responses are quality responses. That just goes to show that a response rate for a real estate investors isn’t the same as a response rate for a business that sells clothes or furniture. The problem isn’t that you’re not getting responses for the amount of direct mail you’re putting out. The problem with direct mail for real estate investors is that you’re not actually reaching your target audience. And if you’re not reaching your target audience, then what’s the point of marketing that way? Especially if it’s costing you a small salary every year just to send out postcards to people who either aren’t going to read them, or people who aren’t going to respond positively. It’s not uncommon for real estate investors to go months without hearing anything from their direct mail, then for them to get only 1 or so leads from their mailing lists. Ask yourself, does that sound like a viable marketing platform to you? It’s a good thing we don’t live in the 1800’s. We have more options today for marketing than newspapers and mail lists. Of your options, there’s offline marketing such as bandit signs and postcards, and there’s online marketing like SEO and PPC. We’ve talked about offline marketing before in our other blog posts, so we won’t go over bandit signs as much. The short end of it is, bandit signs are great and cheap but won’t convert as highly as you’d like it to. The message is similar to direct mail in that you’re casting a giant net out and hoping a fish sees it. Not very actionable. Let’s talk about other options, then. As far as online marketing goes, the two top strategies are SEO and PPC. You can read an in-depth look at SEO (Search Engine Optimization) and PPC (Pay Per Click) in our previous blog posts. In this article, we’re looking at the comparison of costs of online marketing and direct mail. Real estate investors who do online marketing with Pay Per Click generally start to see online leads coming in quickly. The reason for that is because you’re putting your business online to be found by motivated sellers who are actively looking for a way to sell their house. Instead of you throwing out a huge net hoping to catch some fish, it’s more like you’re sitting with a net downstream and letting the fish come to you. With Pay Per Click, your business is being promoted to people who already have an interest in selling their house for cash. Which means the audience that your marketing is reaching is a warm audience, instead of the cold audience that direct mail goes out to. With a warm audience seeing your ads when they type something in Google like “sell my house for cash“, they are actively interested in clicking on the link to your real estate investing website because that search result immediately answers their question. With 30 leads a month, at $20.00 a lead, and a conversion rate of 2.5%, your ROI is $56,250. Now, correct me if I’m wrong with the math, but that definitely looks like a better ROI than the measly $1,660 from direct mail. Especially when you take into consideration the fact that you’re not just throwing your marketing out there with your fingers crossed. Those aren’t empty responses, those are viable leads. If we keep moving forward with this hypothetical, the general amount you’d be looking at spending is $600 a month for PPC. Hmmm…$600 sure is less than that projected $3,000 from direct mail. At this point it just seems like a no brainer to go with PPC. Now, keep in mind that PPC strategies will differ depending on your market. Some online markets are more competitive than others, which is why we suggest using specialists to make sure your money is going to good marketing and not just being thrown away. Just like any new style of marketing, Pay Per Click has a learning curve. At the end of the day, you’re an expert at real estate investing. You shouldn’t be wasting your time learning a whole new style of marketing. You should be spending your time closing deals and doing what you want to be doing. After all, the whole reason you became a real estate investor was for financial freedom! That’s why our team of PPC experts will work with you to specifically craft a Pay Per Click strategy that will get you leads in no time. And we really mean no time. In fact, you can see the success stories of some of our PPC customers right here on the LeadPropeller blog. We Buy 417 went from just a few leads with offline marketing, to tons of leads from PPC when they made the switch with our PPC experts. And Arbor View Properties went from months of nothing to getting 6 deals done in 2 months from leads that came in through his professionally managed PPC service. All in all, online leads are just better leads. You’re not casting a net out to what you’re hoping are fish. With online marketing that’s managed by PPC professionals, you’re sitting back and watching the leads come to you. And for half the price, doesn’t it just make sense? So I’ll ask the question again: is direct mail for real estate investors worth it? Are You a Flip Pilot?